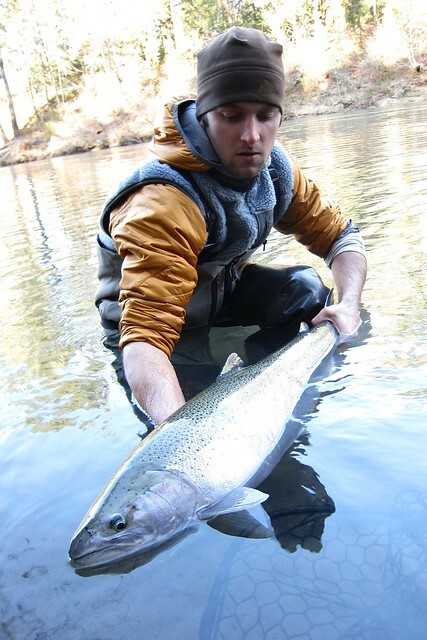 The North Umpqua River is one of the premier places to swing flies in Oregon for Winter and Summer Steelhead. With countless named and unnamed pools sometimes it’s hard to choose where to fish. For myself, Lou, and brother Ty the choice was quite simple. We were fortunate enough to stay at the North Umpqua River Retreat which has enough steelhead fly water right out the front door to keep any fly angler busy for hours. 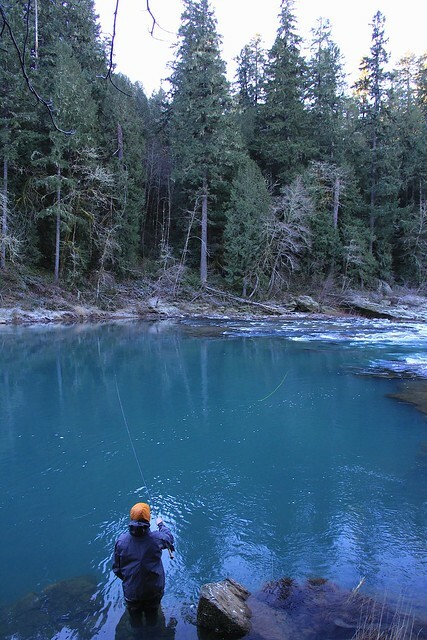 The North Umpqua River Retreat’s home pools were very enjoyable to fish. A classic tail-out that spills into a a perfect step through run, it was hard to fish anywhere else, especially with the option to walk back up to the house and warm up. The mornings were freezing so we would sometimes just sip coffee and ponder the donning of waders while overlooking the water from the living room windows. The central location of the North Umpqua River Retreat makes it a perfect jump off point for numerous Fly-fishing opportunities. During our stay we fished a new section of water everyday; the fly water is a mile to the East, the first boat ramp is a mile to the West, and the main Umpqua is less than an hour away. 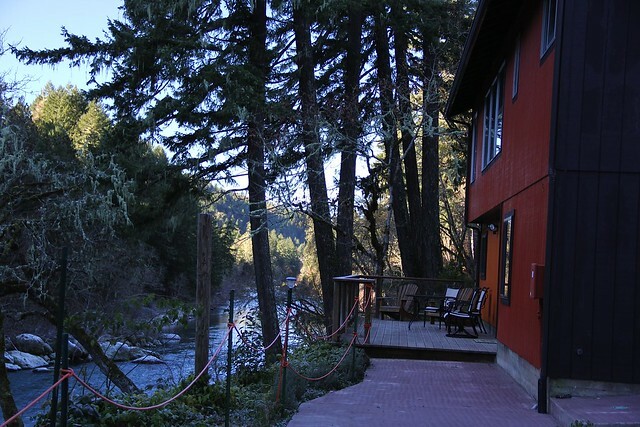 My suggestion would be to stay at the North Umpqua River Retreat for several days to sample a true taste of the Umpqua. 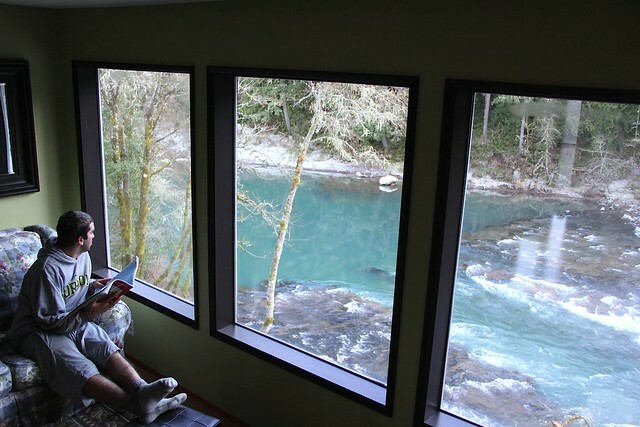 All that stayed at the North Umpqua River Retreat were very impressed with the outstanding accommodations, and the incredible view of the river. Take a look for yourself and Give Rich a call (541-496-4869) as Summer time slots are filling fast and winter is becoming increasingly busy as the North Umpqua River Retreat gains recognition. Many thanks to Rich for his hospitality. This entry was posted in North Umpqua River Fishing Reports, Oregon Fly Fishing Tips, Oregon Winter Steelhead Fishing. Bookmark the permalink. Came across a John Propp Custom graphite 9′ 4 piece 5 weight at a garage sale and bought it. Impeccable condition. I have the same Sage rod, and would like to sell this. He ran a fly shop in Spokane, but am not familiar with his rods, kickpoints and value. I did some research, and see he was President of the Spokane Flyfishing club. He passed away in 2002 (RIP). Definitely of equal quality to my Sage. Does anyone have any idea of value? Thanks Clay, you guys definitely cranked steelhead flyfishing up a notch here. The view of the tailout from that picture window is never bad, but probably never as cozy as during the subfreezing weather you experienced. Similarly, the river is always beautiful here, but to coax that chunky chrome steelhead on a fly from clear frigid waters shows the patience and perseverence I used to have in my Michigan steelheading youth! Glad you enjoyed our North Umpqua lodging and fishing area, it really is a uniquely quiet, fishy, and convenient location. (www.NorthUmpquaRetreat.com). It’s been a busy summer but there are some dates open thru the fall — my favorite time for colorful, uncrowded steelheading! In response to Tom King – John Propp was my Uncle – a legend in my memories and with many contributions to the world at large – so cool that you’ve picked up a piece of his passion. If you’ll get in touch with me at cynthiadeans@gmail.com, I’ll share more particulars with you.